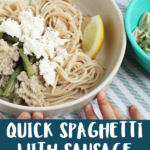 With veggies, complex carbs, and protein all in one bowl, this super quick family dinner of Spaghetti with Sausage is made for weeknights…or weekends when you want to eat well without the fuss in the kitchen! 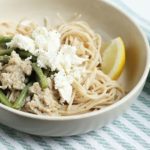 I’m always on the hunt for fast family dinners that everyone at my table mostly enjoys and this Spaghetti with Sausage with green beans and feta is a recent favorite. 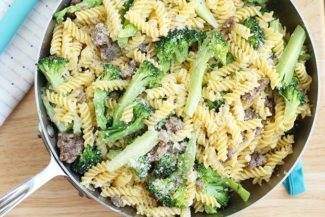 It’s easy for the kids to see the ingredients so there’s no need to be scared of what’s on their dinner plate and the flavors are pleasing to both kids and adults. I love this recipe even more since it’s so easy to customize. If feta is too strong of a flavor for your kids, use crumbled goat cheese instead—or let them decide to skip the cheese all together. (I have one kiddo who goes for the feta and one who skips it and it’s all okay!) If you love spicy foods, top your plate with crushed red pepper. Not in the mood for spaghetti? Use another shape! 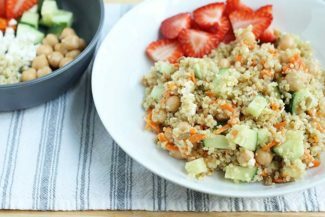 (Or even couscous or quinoa.) Or, try broccoli or cauliflower instead of the green beans. Swap things in and out as you see fit to please your people. 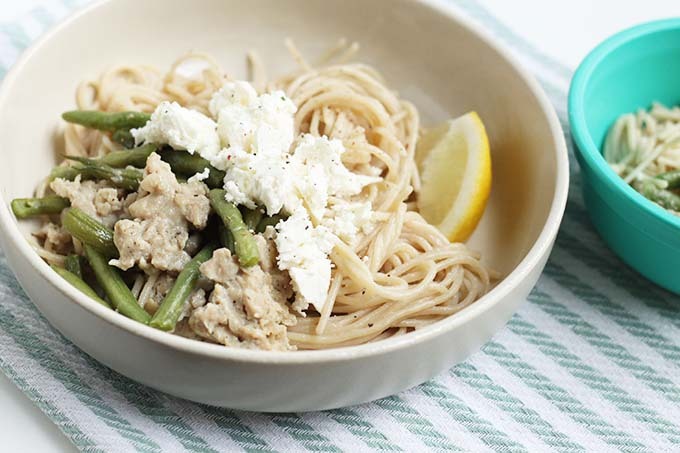 For this easy family meal you’ll need spaghetti (use whichever kind you like! ), bulk Italian sausage, green beans, and feta cheese. You can add more flavor with fresh lemon if you like, but it’s optional. What kind of Italian sausage is best? 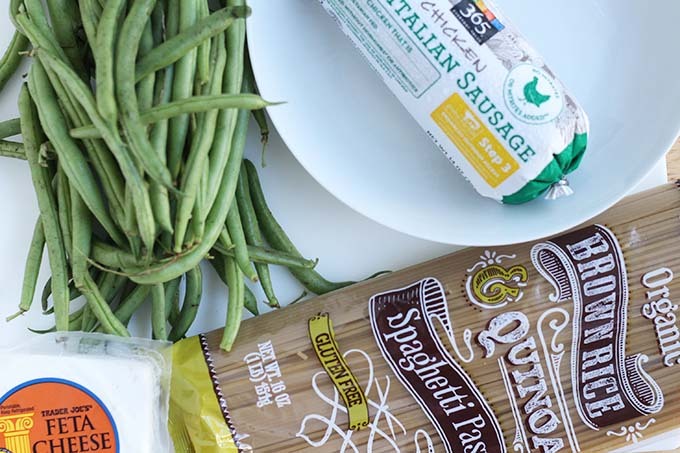 Here’s a look at the straight forward process involved in making this easy pasta dinner. Add the oil to a medium skillet over medium heat to warm. Add the sausage and green beans, stirring to break up. Cover and cook, stirring occasionally, until the sausage is cooked through and the green beans are bright green and tender. Cook the pasta according to package directions. Drain and reserve 1/2 cup of the cooking water. Stir the pasta into the sausage and green beans to coat, adding another drizzle of olive oil and as much cooking liquid as is needed to coat the pasta well. Sprinkle with salt and pepper and serve topped with crumbled feta and fresh lemon, if using. What’s the best way to serve this to my kid? 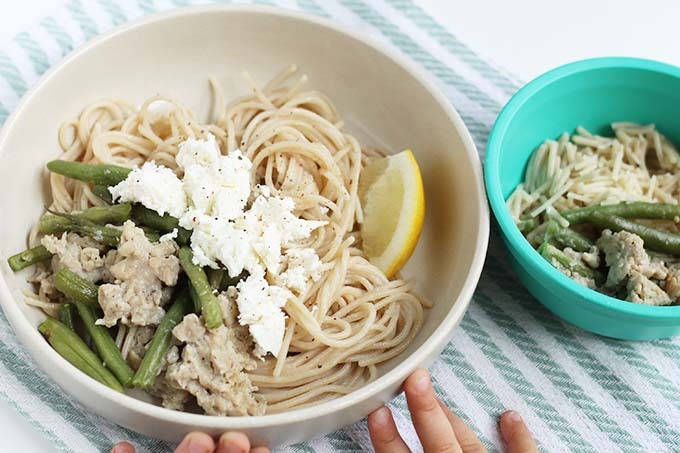 I recommend snipping the spaghetti with kitchen shears so it’s easier to chew and then letting the kids weigh in on whether or not they want the feta and lemon. Giving them a little power can go a long way towards happier meal times. 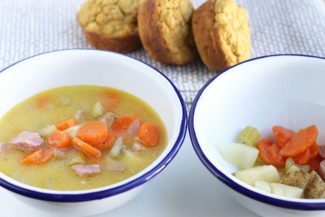 I’d love to hear what you think of this dinner recipe or if you have any questions. Please comment below! Finish the adult servings (and more adventurous kid plates!) with a squeeze of fresh lemon and maybe crushed red pepper. Add the oil to a medium skillet over medium heat to warm. Add the sausage and green beans, stirring to break up. 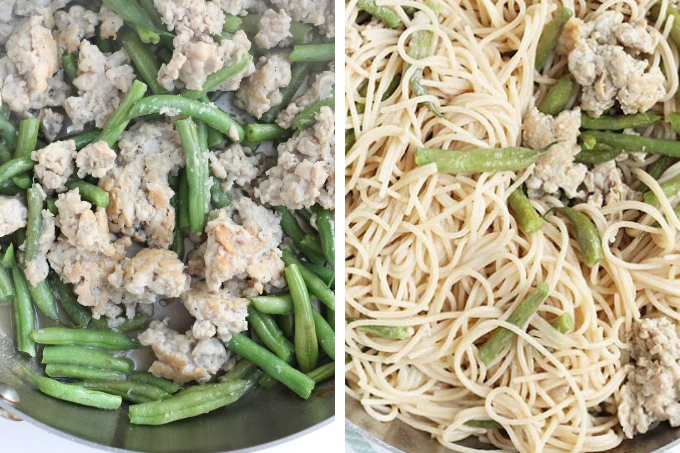 Cover and cook, stirring occasionally, for 8-10 minutes or until the sausage is cooked through and the green beans are bright green and tender. Meanwhile, bring a pot of water to a boil. Cook the pasta according to package directions. Drain and reserve 1/2 cup of the cooking water. Stir the pasta into the sausage and green beans to coat, adding another drizzle of olive oil and as much cooking liquid as is needed to coat the pasta well. Sprinkle with salt and pepper and serve topped with crumbled feta.